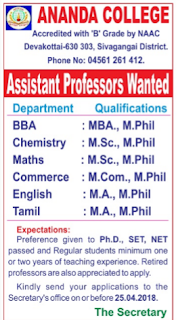 Ananda College, Sivagangai has advertised in THE DINAMALAR newspaper for recruitment of Assistant Professor jobs vacancies. 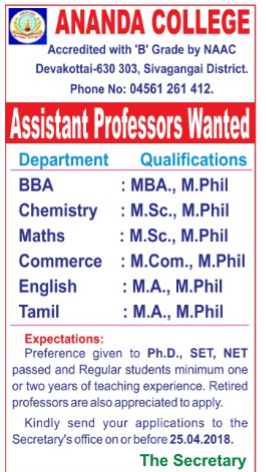 Interested and eligible job aspirants are requested to apply immediately before 25th April 2018. Check out further more details below. Name of the College : Ananda College, Sivagangai. About College: To form students to face the challenges of life in a dignified manner, esteeming fellow humans and the world as sacred and to produce the following vital aptitudes in its students; the ability to think clearly, acquire knowledge of the past and present, envisage the future, develop skill to do service, and continue all these for creating a healthy and self-reliant community. How to Apply: Kindly send your applications to the secretary's office on or before 25/04/2018.